1. The flight attendant who saved the day. Although babies on airplanes is a hot-button topic for all kinds of different people, it’s arguably the hardest for parents with children. Nobody likes a crying baby on a plane, but it’s still our responsibility to be kind and helpful to the parents when it happens. While the business class passengers weren’t willing to do so, luckily this flight attendant was ready to help out. 2. The whole bookstore who pitched in. Being LGBTQ in America still comes with its unique challenges, even if the world has become more accepting. 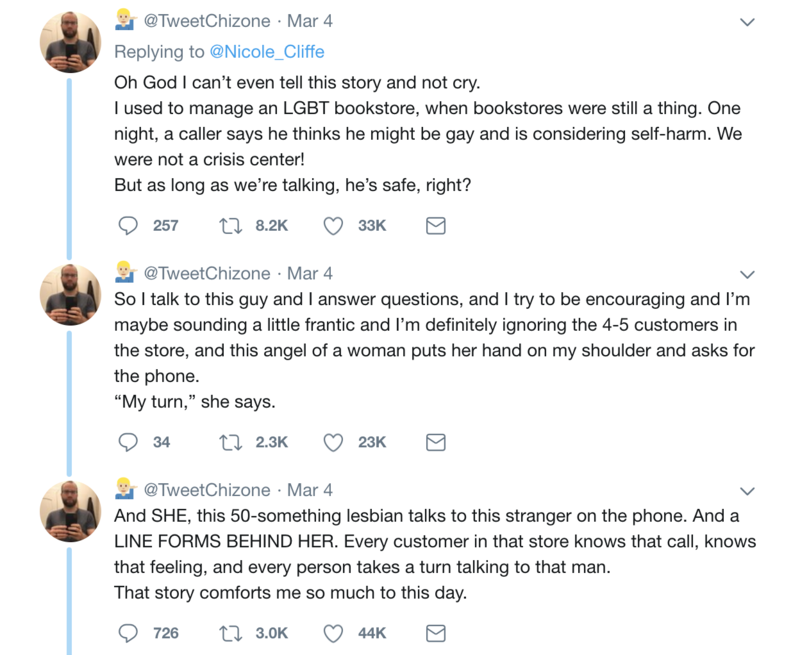 As evidence of that, consider this story of a man who called into a bookstore considering self-harm and looking for some support. Fortunately, the entire store was willing to listen. 3. 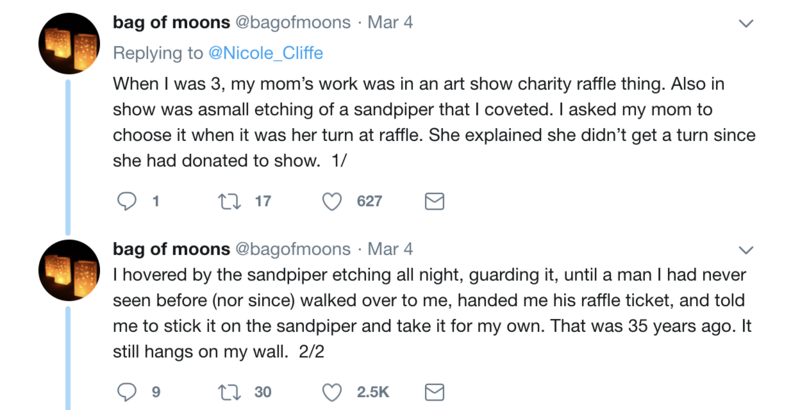 This kind-hearted art buyer. Have you ever been to an auction or an art raffle? If so, you know just how stressful it can be to try to get the paintings you want—especially if you’re a little kid with little control over the proceedings. Fortunately for the person in this story, one man in the crowd was more than ready to show some understanding. 4. These bank employees who went the extra mile. Being alone in a foreign country can be pretty intimidating even under the best circumstances. Still, when we run out of money or something else unexpected happens, we can get very stressed out. Fortunately, sometimes the locals come to our rescue in the most surprising ways. 5. This understanding mariachi band. No matter what your political views are, we can all agree that the atmosphere in the United States after the 2016 election has been pretty polarizing. Along with that have come increased tensions between various ethnic groups. As this story shows perfectly, a little bit of cultural understanding can go a long way. 6. Kind strangers on the subway. Living in a big city means living among all kinds of different cultures. As a result of that, not everybody can always communicate and some people don’t speak the same language. 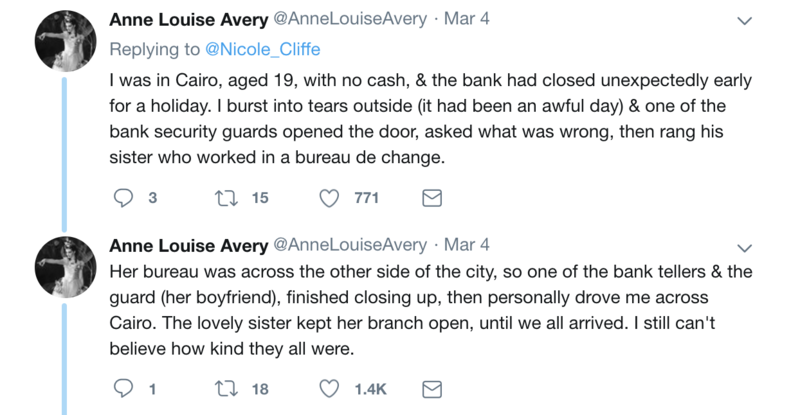 Still, as this story shows, sometimes love and kindness are the only languages we need! 7. This family who all pitched in. Having any kind of medical emergency can definitely upend a family’s life. Aside from the fears about one’s personal health, there are also a lot of logistical concerns that come with the recovery process. Fortunately, the family in this story all decided to help out as much as they possibly could. 8. Help from an animal is always welcome too! Although most of these stories involve kind people pitching in, sometimes it’s an animal who comes to our aid. As it turns out, support animals are ready to pitch in no matter who is in trouble—their training overrides everything else! 9. 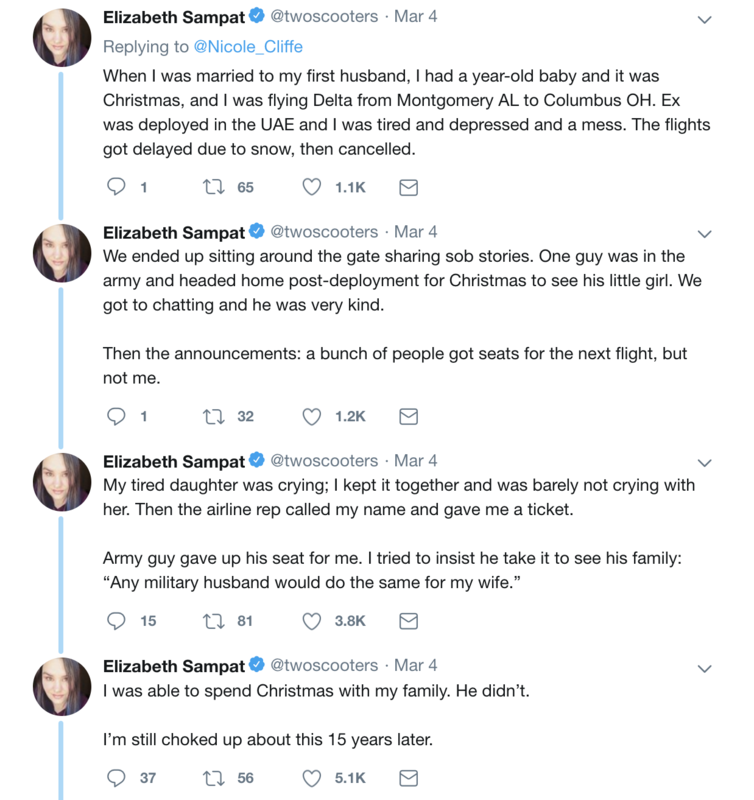 This Christmas sacrifice by a military husband. Having family members deployed overseas is a hard emotional task for anyone to go through—and the stakes are even higher around the holidays. Traveling home for Christmas can be stressful no matter what, but when there are travel complications, it makes things even worse. Fortunately, this kind stranger was willing to sacrifice his own trip for this mother’s happiness. 10. A little kindness towards parents goes a long way. As we said before, trying to take care of a baby on a plane is quite a task. No matter how irritating an upset baby might be to the other passengers, nobody is feeling the pressure more than the parents themselves. As this elderly couple showed when the flight was over, a little kindness can make all the difference. 11. For every person who is thoughtless or cruel, there’s another kind one. In case you didn’t believe us that airplanes were such a point of controversy for parents with little kids, consider this story of someone going out of their way to be mean to a toddler! Fortunately, there was another good samaritan who stepped in to make a positive difference. 12. How many compliments does it take to undo criticism? Anyone who grew up with tough or critical parents knows just how much it can affect our self-esteem. Comments about our physical appearance can be particularly hard to shake. Fortunately, sometimes a kind stranger with a British accent can turn it all around. 13. Sometimes all it takes is some nice words. Look, we’re not necessarily saying that catcalling is good practice… but if someone is going to catcall at all, we’d like it to be as thoughtful as this construction worker was. 14. It’s impossible to be mean when there’s a cute dog around. Leaving your window down in the car leaves the opportunity for other people to communicate with you wide open. Most of the time, people aren’t necessarily looking to be mean… but sometimes women can get harassed that way. Fortunately, this was not one of those times. 15. Love works in strange ways. Though we take a lot of things for granted in the United States, not all countries experience the same freedoms we do when it comes to what we watch and who we love. 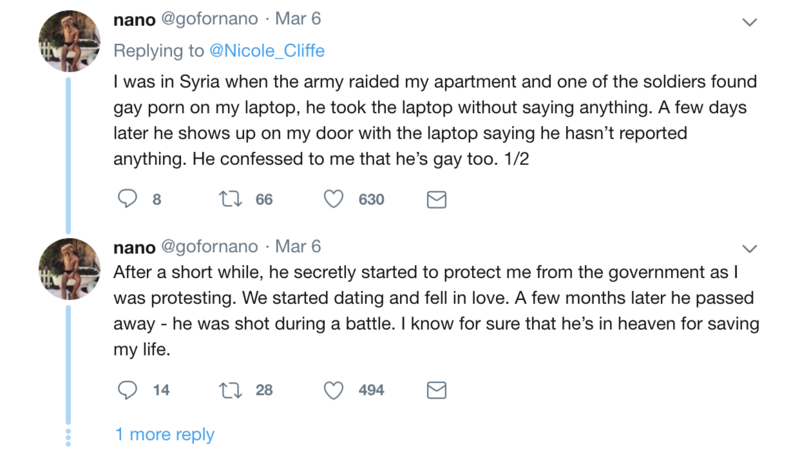 As one man’s unusual story in Syria shows, love and kindness can come in many different forms. 16. Aside from just with children, understanding at an airport works wonders. Most of the time, transfers and refunds at airlines are accomplished at the discretion of the airline workers (and can vary significantly). 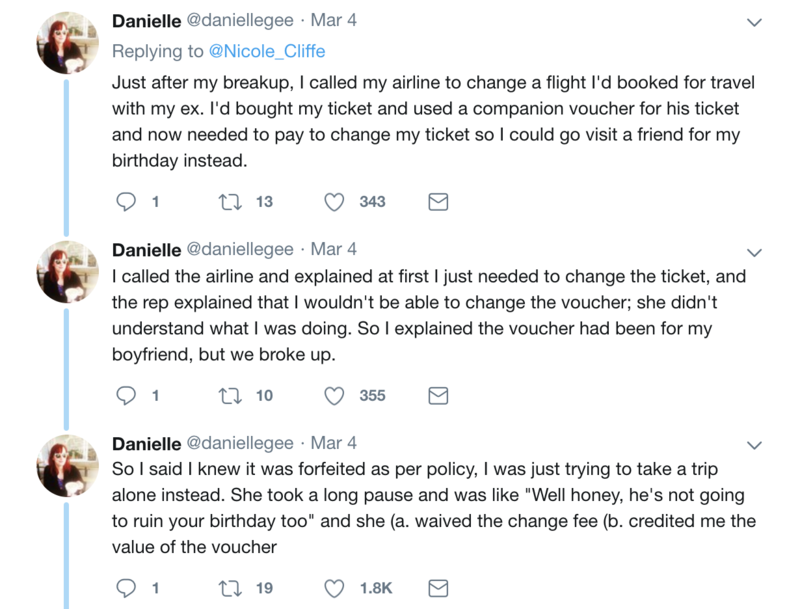 Although a lot of the official policies on tickets and other vouchers is that they can’t be changed or transfers, sometimes special situations like this one happen—and kindness makes all the difference. 17. Sometimes you have to be a little tough to be kind. The worst thing in the world is when a few people who are bigger or stronger gang up on people who are smaller than they are in some way. In those situations, it’s important to call on our bravery and step in whenever possible. And that’s exactly what this dad did. 18. Showing a willingness to listen can make a big difference. If you travel on public transit very often, you’ve probably seen some of the billboards addressing self-harm and suicide prevention. 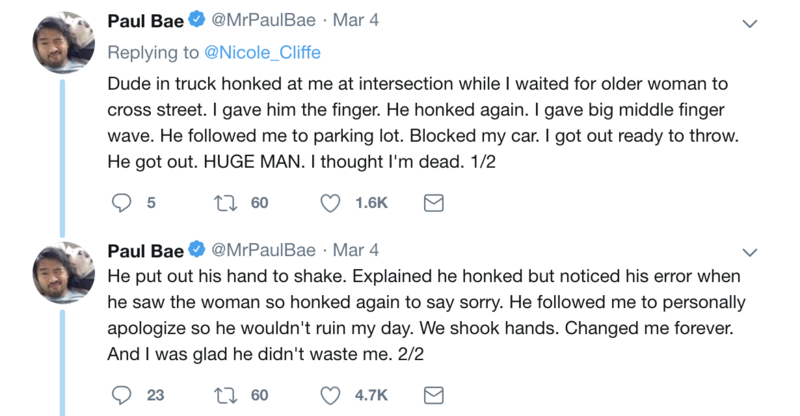 Although it’s a helpful message for anyone to hear, anyone who truly stops and reads these signs is probably wrestling with something—at least, that’s what the kind man in this story thought. 19. Thoughtful teachers can help out a lot, too. Have you ever had one of those dreams where you’re worried you missing something important? Or a dream where you show up in class with no clothes on? Though it goes without saying, college can be a stressful time—especially if you actually do miss a final! Fortunately for the girl in this story, her TA couldn’t have been more understanding. Like we said: nobody wants to have the experience of missing something important like an exam. And if you do happen to remember and run out the door to make it, you might end up forgetting some things. If you’re lucky, you’ll run into a kind-hearted person in the process! 21. Ok, only one more of these. Though there are many ways to avoid the college-related crises that we’ve just outlined, this is one of the more creative ones that we’ve found. Even though this student slept through their exam, the professor went above and beyond to make sure they completed the exam anyway! 22. You never know where kindness is going to come from. After we go through a serious trauma of any kind, we’re bound to be much more tender and sensitive afterwards for quite some time. The same applies when we’re in new and uncomfortable situations. 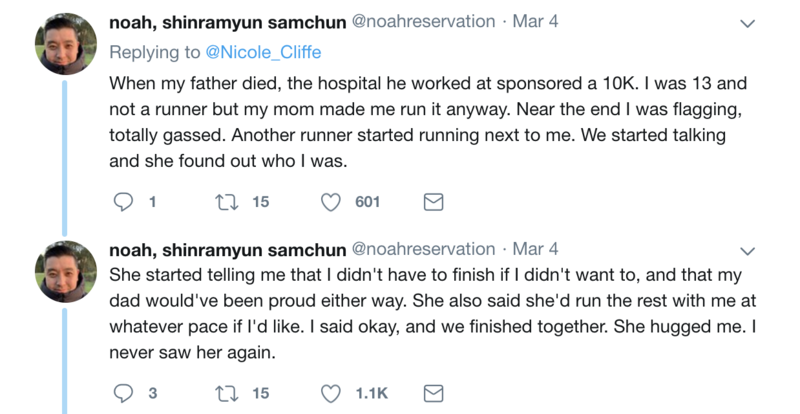 The man in this story was both, and someone stepped in to help. 23. More people should be thoughtful like this. It can be easy to get overwhelmed in a new city. 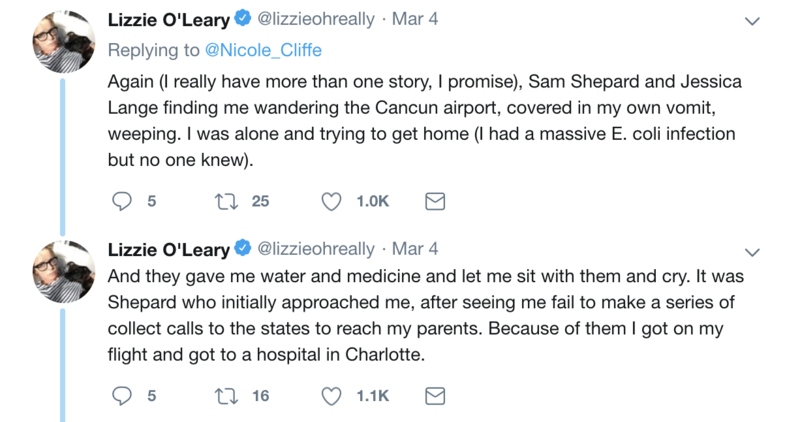 If you’re feeling particularly stressed out or you have a proclivity towards mental health problems in general, getting publicly overwhelmed can even be dangerous at times. Fortunately, sometimes there are people around ready to help out. 24. Every once in a while. the good samaritans we run into might be celebrities! If we didn’t make it clear by now, the airport is often a prime location for things to go wrong for people. Though it’s great when another passenger or an airline worker helps us out in those situations, sometimes even celebrities will step in! Ok, we know this one is once-in-a-lifetime, but it’s fun to dream. 25. Help from medical professionals can make a huge difference in our lives. Getting the medical help we need can make all the difference to us in our everyday lives. 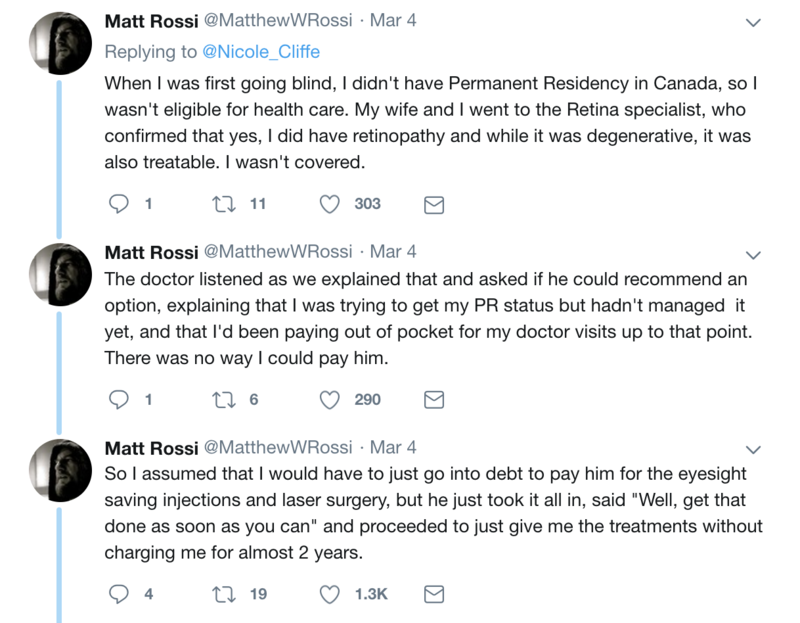 Still, medical support doesn’t come cheap—and it can sometimes be prohibitively expensive. Although it doesn’t happen too often, having a generous doctor can make all the difference in those situations. 26. Some strangers will even give you the coats off of their backs. Though that old saying sounds like a cliché, there’s at least a few stories out there that prove that it’s a real thing! This pregnant woman, for example, learned firsthand just what that saying could mean—and given the situation, we’re guessing she’ll never forget it. 27. It’s great when people use their personal connections to help out others. We’ve all seen at least a few professional-looking businessman at airports or on airplanes. Most of the time, they’re sitting in first class or business class, not doing much interacting with the rest of the people on the plane. Fortunately, that wasn’t the case in this story. 28. 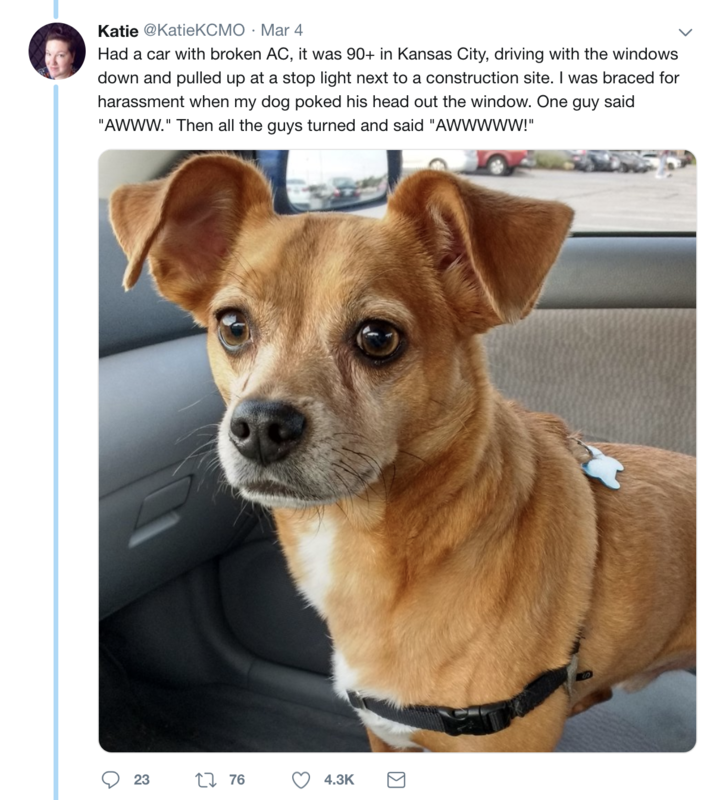 Aside from the kindness of this story, there’s an important lesson as well! Having serious car trouble on the highway is probably a nightmare situation for most people—particularly young people who are new to a big city. 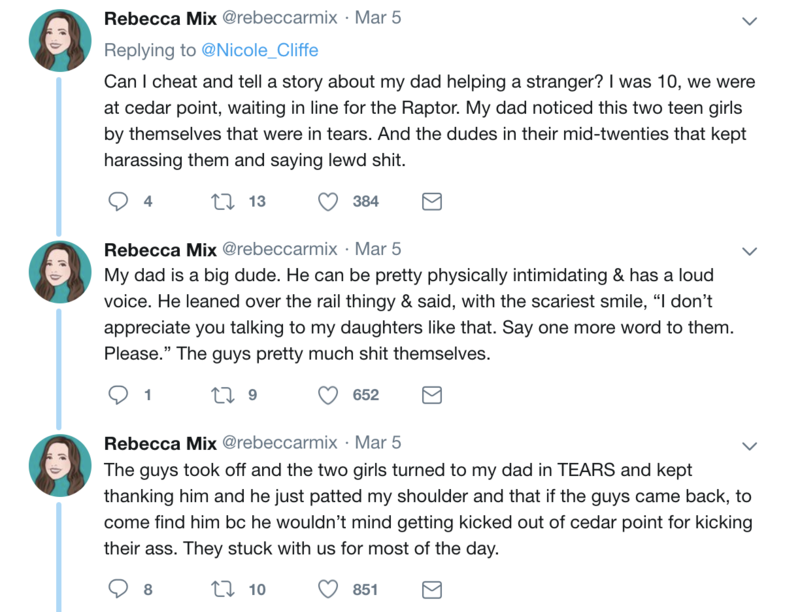 It’s a good thing that the father in this story could help out. 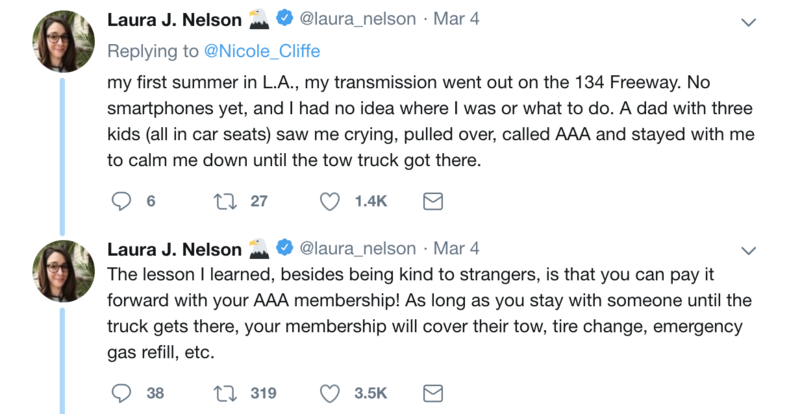 Additionally, we really didn’t know this about AAA memberships! 29. The littlest gestures can sometimes make the biggest difference. Though moving to big cities like New York or Los Angeles comes with the stereotype of people crying on the subway, nobody wants to actually be that stereotype. 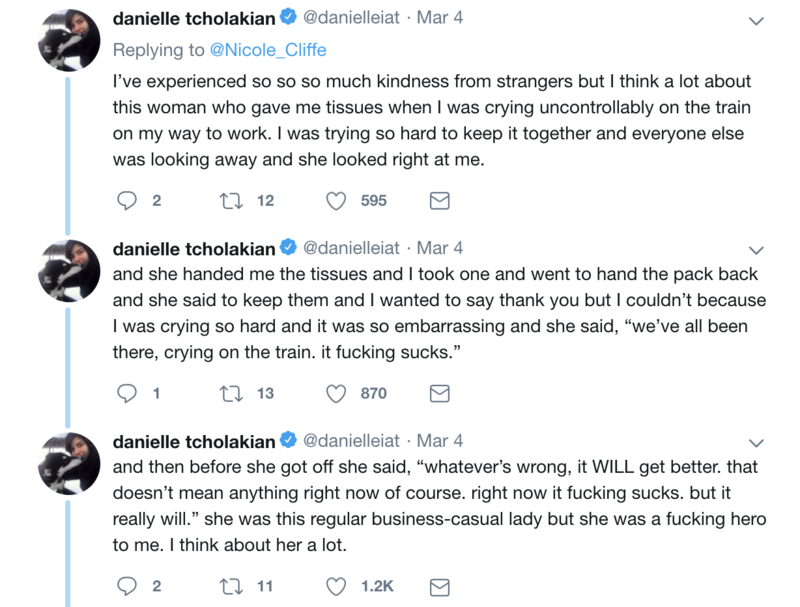 Still, it ends up happening to a lot of us—and when someone can step in to help, it makes the situation so much better. 30. Who knew someone could be so nice? Few things are more stressful (or more embarrassing) than not having enough money to pay for groceries… or for anything else for that matter. Most of the time we have to eat the mistake and head home. Once in a while, though, the people working cut us a much-needed break. 31. Paying attention to one’s surroundings can pay huge dividends. Life is incredibly hectic and it’s nearly impossible to be proactive about everything at all times. Still, paying close attention to one’s surroundings can lead to all kinds of opportunities to step in and help other—just like the mechanic in this story did. 32. Some stories show us that surface judgments don’t get us very far, either. Whether we like it or not, many of us walk around with all kinds of known and unknown stereotypes about others. Riding on the bus or other forms of public transit exposes us to a wider range of people than we might be used to otherwise. And if we’re lucky, we can learn these lessons through kindnesses like the one in this story. 33. If you see someone getting bullied, speak up! Though it goes without saying, it hurts a lot when we get yelled at or criticized by others, no matter who they are. 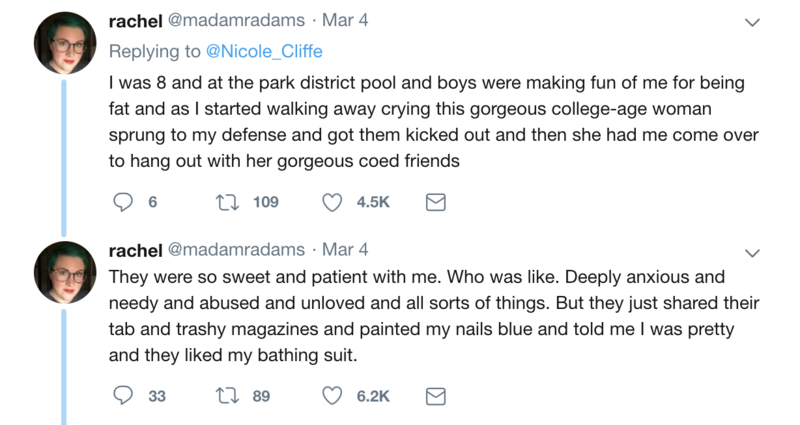 When that happened to the girl in this story, another group of older girls stepped in and quite literally saved the day. 34. Support from others can help us in the worst situations. 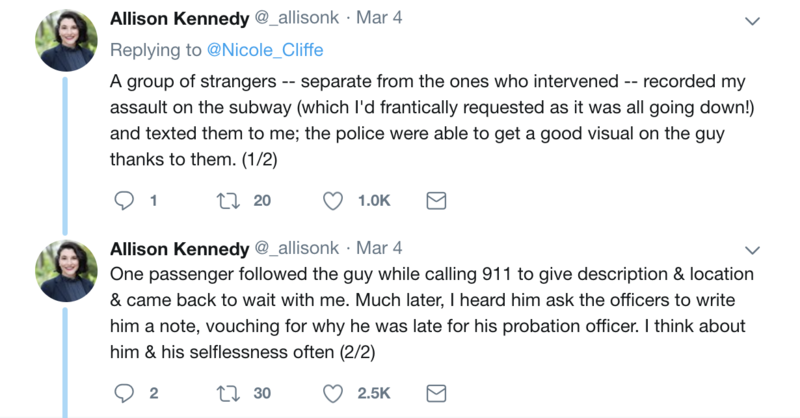 Although this story begins with a woman on the subway getting assaulted, it ends with justice because of the kindness of the other people who were there when it all happened. Although we can’t always single-handedly save the day, helping in any way we can is always appreciated. 35. You can make somebody’s day better, no matter who you are. As it turns out, how much we have or who we are really doesn’t need to play into how nice we are to others. Just because we’re not rich doesn’t mean we can’t contribute. For proof of this, just consider the guy in this story who decided to give a simple compliment! 36. This one is a little confusing… but hey, we’ll take it. We can all fall victim to road rage at times. For whatever reason, being safe in our car makes us feel like we have a license to be rude to other people at times! Still, it’s much harder to apologize for something you’ve done wrong in a car—but this man still managed to do so. 37. We all need more confidence boosts like this one. If you’re in the habit of taking a lot of Lyfts or Ubers, be nice to your drivers! 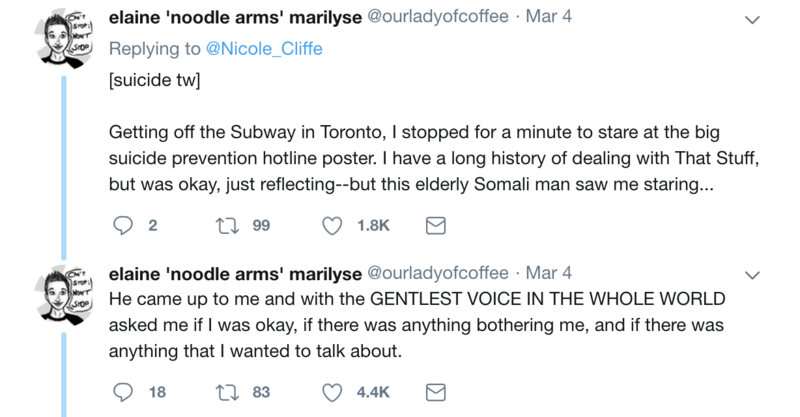 Although it’s a common courtesy just to be nice to other people, sometimes it pays off the other way as well—which is exactly what happened in this story. 38. Making someone laugh can turn their whole day around. We’ve definitely all been through experiences that make us sad and that threaten to ruin our day. The worst thing that can happen in these situations is that we beat ourselves up or that we feel alone. Fortunately, the girl in this story was determined not to let that happen!